I’ve been wanting to do a gallery hub site like foodgawker and Tastespotting for a while now and could never figure out how to do it when someone finally told me that it’s basically just run on WordPress. I started thinking of names, making Jenn wrack her brain too, and whatever we came up with was taken. I looked to my smartypants husband for ideas and while I was picking Buddy up from preschool, he waited in the car. 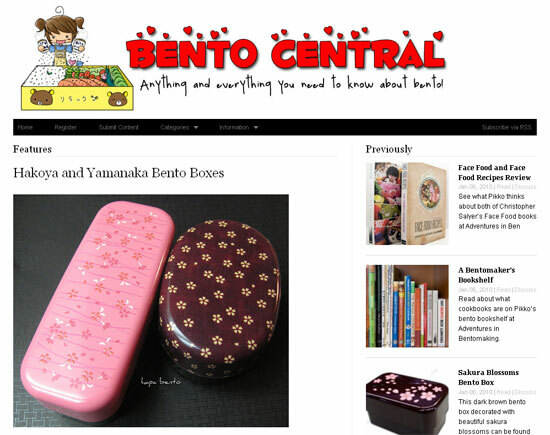 When I came back, he gave me “Bento Central” and that led to more ideas and when I got home, I bought the domain and hosting. Around 24 hours later, after two nights of tinkering, the site seemed relatively ready so not being one to wait on my new ideas, I announced it right away. It basically takes the idea behind the LJ community Bento Lunches and sorts entries into categories for easy browsing. If you want to share your lunches, but don’t do them often enough to run your own bento blog, you are more than welcome to post them at Bento Central. Register and begin submitting content and hopefully we’ll all have a great bento resource all in one place! I’m trying out something new in 2010, which will be a bento article/tutorial on Mondays and lagged lunches one day after I eat them. I want to make this place more than where you just oogle at my food. I think it’s also high time for a remodel! This is my bento that I ate yesterday, made with some leftover Korean food we had for dinner the other day and packed in my newest Hakoya wooden lacquer box from J-List. Isn’t it just utterly beautiful? It comes with two removable dividers that lock together in the middle, giving you a nice segmented box or a nice, large box for your lunch. I left out rice so that I can start getting used to eating healthier again. I’m still debating whether or not I’ll officially subscribe to Weight Watchers again or just try it on my own. I think if I try it on my own I won’t be able to stick with it, but we’ll see. I haven’t weighed myself in a while, but I’m guessing after the holiday horrors I’m probably around 150, which was where I was when I started WW two years ago. Using my electric toothbrush, floss, and mouthwash twice a day instead of once every couple of weeks. Don’t get all grossed out, I brush, just by regular toothbrush. I don’t do a very good job though, and I usually forget to wear my night guard too. I’ve been really good with this one! Cut down very heavily on sweets and eat more fruits. Manage my time better. This means brushing my teeth while loading things in the car. Brush my hair more often. I’m pretty disgusting here, washing daily but only brushing my hair maybe once a week and then having a big hairball by my neck eventually. Keep kitchen sink permanently clean. This one has miraculously been happening too. Can you believe it, Yvo?!? There are more, but I’m getting tired and lazy just reading what I have so far, so I’d better quit now. If you’re on Twitter, be sure to follow me!